Bilateral ties between South Africa and Iran are at an all time high, but who is really setting the agenda, asks Muhammad Sheik. Two weeks ago reports that a high level Russian delegation had landed in the country sparked rumours and further debate over the proposed nuclear deal. Questions were asked about whether President Jacob Zumaâ€™s most recent cabinet reshuffle, and the installation of David Mahlobo as the new minister of energy, is in fact an attempt to fasttrack the process, which has now been reported as a political decree from the Kremlin. Last week, the Iranians arrived. Iranian Foreign Minister Mohammad Javad Zarif was in South Africa, heading a political and economic delegation. 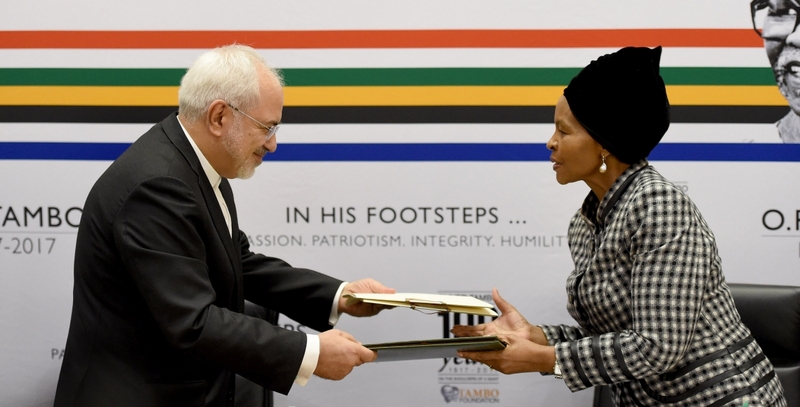 According to Iranian Foreign Ministry spokesperson Bahram Qassemi, Zarif undertook the trip to Pretoria at the invitation of South African Minister of International Relations and Cooperation Maite Nkoana-Mashabane. A number of politically significant issues were on the agenda. According to the department of international relations and cooperation (Dirco), the purpose of the 13th joint commission is to consolidate and track progress as well as implement the agreements between South Africa and Iran. The department of trade and industry, together with its Iranian counterparts, hosted the South Africa-Iran Business Forum at the Dirco offices in Pretoria on Monday, 23 October. According to reports, held talks with Zuma and his counterpart Nkoana-Mashabane. This trip however is far more politically consequential than we may realise. From both a global and regional perspective, the visit of a role player as influential as Zarif is crucial in sustaining the historically strong bilateral relations between Pretoria and Tehran. This cosy relationship between the two states is not without its share of scandal. Prior to the re-establishment of ties with South Africa in 1994, Iran had several dealings with the National Party government. Under the Pahlavi regime ties with the apartheid government were warm. After Reza Shah abdicated in 1941, he exiled himself to South Africa and died in Johannesburg in 1944. His son, Mohammad Reza Pahlavi visited South Africa during the 1970s where he was received by then Prime Minister, BJ Vorster. Despite continued clandestine operations between some of the worldâ€™s largest spy agencies against Iran, ties between Pretoria and Tehran have flourished since 1994. Iran is a powerful and influential global ally to South Africa which occupies a strategic position on the African continent geographically, politically and economically. It is the second largest economy in the Middle East region in terms of gross domestic product totaling US$438 billion in 2016 and, with 80 million people, the largest market in terms of population. It ranks second in the world in terms of natural gas reserves and fourth in proven crude oil reserves. The MTN Group has a 49% stake in government-controlled MTN Irancell, the second-largest mobile phone operator in Iran with 21% of MTN’s subscriber base coming from the country. This is not to say that economic ties between South Africa and Iran have soured. On the contrary, bilateral ties continue to grow at a rapid pace, with Iran now looking to South Africa to support its right to develop nuclear power for peaceful purposes. Iranâ€™s ambitious nuclear enrichment model has been impressive to many states globally, especially as its own indigenous expertise is almost completely responsible for the research and development of the countryâ€™s nuclear capability. Securing support on the international stage from South Africa shouldnâ€™t prove too difficult for Iran as during the 12th meeting of the South Africa-Iran joint commission held in Tehran in May 2015, Nkoana-Mashabane was vocal in condemning the imposition of sanctions against Iran (prior to the Iran nuclear deal), referring to them as “irrational and illegal“. Global suspicion of Iranâ€™s allegedly sinister nuclear objectives, pushed by the United States, has done little to taint ties between Tehran and some of the biggest global players. Strong diplomatic ties with Russia, China, Turkey and smaller but nonetheless important partners like South Africa allows Iran to continuously punch far above its weight in the international arena, which is a constant slap in the face to US power. As history has shown, be it sanctions due to alleged violations of international law, condemnation from major world bodies or incurring the displeasure of the US, any vacuum left by one state will quickly be occupied by others. comrades I believe their is something to learned from Iran. Iran managed to maintain itself through virtually unbelievable hardship caused by western civilization nations. In addition to a great ability to improvise there have to be some unbreakable method they applied that allowed them to improve their security plus order while upgrading living conditions. Iranian phenomenon started with creation of engineers of all sort plus abundance of medical professionals. Iran knows well that even those as students who do not find themselves ideal candidates for being engineers or/plus medical professionals thrive at other professions not having academic requirements of engineering or/plus medical profession if their pre higher education curriculum is designed for would be engineers or/plus medical professionals. This is cause I repeatedly plus likely will continue to recommend that African school curriculum be one designed to create engineers of all sort or/plus medical professionals. That curriculum should feature mathematics to highest degree basic mathematics to eventually calculus , common problem solving methods plus science. It will lead to restoration of Buntu Africa which existed when Buntu were considered people of Books. In short such curriculum will combat “brain drain” this world subtly subject Africa to. For first time since Mansa kankan Musa left Africa on voyage we are of position to overcome Buntu “brain drain” we were subjected to by those who conquered Buntu Africa plus kidnapped all scholars, would be scholars, craftsmen plus would be craftmen leaving overwhelming majority of Buntu without teachers or/plus trainers thus causing Buntu civilization to go from number one in modern living development to being stuck in time plus lacking modern development. We Need Engineers Of All Sort plus Medical Professionals. With such people we will build Africa as perfect overcrowded continent. Very much sincere, Henry Price aka Obediah Buntu IL-Khan aka Kankan aka Gue.